I love seeing more natural and organic beauty boutiques opening up and awareness for safer beauty products growing. US-based online store The Choosy Chick launched last year and I really admire the founders' "choosy" standards when it comes to product selections - you can rest assured that every single product stocked in their boutique reaches a high standard of safety, effectiveness and sustainability too! I was excited to hear they have recently started shipping worldwide - I haven't placed an order with them myself just yet, but I'm definitely planning on it in the near future! The brand selection is really great with a range of skin, hair and makeup products from some of the more well-known brands like Acure, Badger and 100% Pure, along with some new-to-me brands too such as Ahnesti, HollyBeth Organics and Max Green Alchemy. 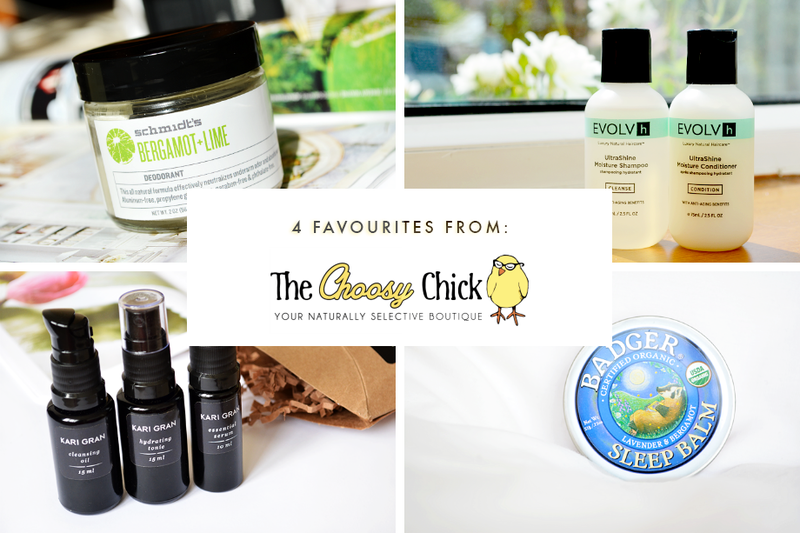 Today I wanted to share some of my favourite tried and tested product picks stocked at The Choosy Chick! This is easily the most heavy duty deodorant out of all the natural ones I've tried, although I do only use it rarely as I find the amount of baking soda can sometimes be irritating. This is one I would take on holiday for really hot weather or for intensive exercise as it keeps you smelling fresh, even when sweating buckets! My favourite scent is the Bergamot + Lime and I like the Lavender + Sage too. I tried travel sizes of this shampoo/conditioner duo last year and was amazed how much it reminded me of "conventional" salon haircare products. Not only do they produce a nice lather, they also smell really good and are perfect for a moisture boost to my dry hair. I still haven't spotted a UK stockist yet so I'm thinking I will order some more travel sizes from The Choosy Chick soon! I fell head over heels in love with Kari Gran on my very first encounter. If I had a more generous budget, I would definitely be using Kari Gran's products all the time! The skincare system includes a cleansing oil, hydrating tonic (toner) and serum which all work fantastically. Honestly, my skin looks the best it has ever looked when I use these products and I can't wait to save up for them again! Since I discovered this Sleep Balm, I haven't been able to live without it! Whenever I'm having trouble falling asleep at night, I find the scent of this balm so calming to help me switch off and fall asleep in no time. Even if you're sceptical about aromatherapy like I once was, just give it a try for yourself and you might be surprised how much products like this can help! Have you tried any of these products before? What are your favourite picks from The Choosy Chick? P.S. The Choosy Chick is offering you guys 10% off your first order until July 15th - just use the code NATURIA at the checkout! The sleep balm sounds so lovely. I've never used one before. Check out my MAC Lipliner x3 giveaway! I'm definitely eyeing Kari Gran. The Choosy Chick carries some really lovely brands!